Barlows Agri become MX main dealers for Cheshire. We are pleased to announce that we are now MX main dealers and can supply the full range of MX machinery. 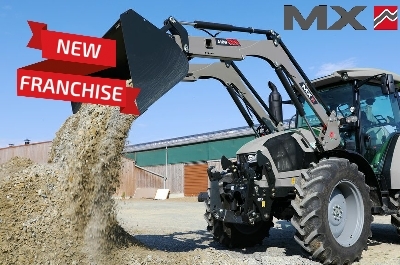 MX were formed back in 1951 and have since gone on to be one of the World leaders in front loaders and implements. T400 Series Front Loader range: With 7 models in the range suitable for tractors from 45 to 280hp and lift heights from 3.75mtrs to 4.60mtrs. Lifting power ranges from 1250kg on the entry-level T406 front loader through to 2670kg on the T417 and T418 front loaders. U300 Series Front Loader range: With 9 models in the range with or without parallelogram suitable for tractors from 35 to 150hp and lift heights from 3.50mtrs to 4.15mtrs. Lifting power ranges from 1400kg on the entry-level U303 front loader through to 2200kg on the U309, U310 and U312 front loaders. Compact Loaders: With 6 models in the range suitable for tractors from 15 to 65hp. Lift heights from 1.92mtr to 2.60mtr and lifting power from 420kg on the MX C1 to 990kg on the MX 30C+. Municipality Loaders: This range of MX loaders have been adpated to suit the Local Authority, Public Works and Communities, etc. and features include lift/bucket safety devices and fall protection device. F300 Series Front Loader Range: These narrow MX loaders are perfect for fruit, vineyard and orchard tractors from 50 to 120hp. With a lift height of 3.20mtrs and a lifting capacity of 1400kg. Front Linkages: MX offer a wide range of front linkages for tractors 25 to 250hp to suit compact tractors, fruit and vineyard tractors and agricultural tractors with some models having adjustable arms. Lift capacities range from 500kg through to 5300kg. Front Power Take-Off (PTO): MX PTO units are specifically developed to perfectly integrate with MX Front Linkages. With a multi-disc oil immersed clutch all our PTO system have been tested under extreme working conditions too guarantee reliability and optimum performance. Counterweights and Weight Carrier: MX have 6 models of Counterweights with 14 possible configurations from 250 to 2300kg and the MX Weight Carrier can be attached to the MX Weight to increase the Counterweight. Loader Fork/Grabs: Manure forks (with or without grab), general purpose grab and general purpose manure fork. Pallet Forks and Carriers: With the TR1650 (lifting capacity of 1650kg) and the TR2500 (lifting capacity of 2500kg), both with adjustable fork spacing. Bale Grabs: The MANUBAL range makes managing bales much easier and can handle round bales, square bales, wrapped bales and also feature bale stackers. Bale Spikes: The MANUBAL range makes handling bales much easier and features 3 bale spikes that cover everyday handling jobs to heavy jobs. Wrapped Bale Handlers: With 2 models capable of handling wrapped bales up to 1200kg. Height Extensions: These can help with bale building and stacking options. Feeding Buckets: There are options to suit front loaders, front linkage and telescopic handlers and can come with options such as silag pick-up tines, grabs, agitators, rotors and root cutters. Telescopic Implements: Including multi-purpose buckets, silage buckets, large capacity buckets, Earth buckets, manure forks, combination grabs, bale spikes, wrapped bale handlers, bale grabs and pallet fork and carriers. MX also have the FLEXPILOT® system – Independent spool valve actuated by a low pressure hydraulic circuit connected to a multi-function control lever and is exclusive to MX, the TECHPILOT® system – Electronic control in Double acting with maintained float position, the PROPILOT® system – Cable control in Double acing with maintained float position, the ECOPILOT® system – Double action cable control + notched floating position (for Utility loaders, not compatible with Mach System) and Original Control Valve – the loader can be directly connected to the tractor’s original control valve, be it mechanical or electro-hydraulic (customised to the tractor model). For more information on the MX range of products, contact our sales team or visit the MX website.